While most four-year-olds were throwing things around the sandbox, Colleen Gnos spent playtime armed with paintbrushes and bottles full of colour. By her junior year in college, she was taking a year abroad from the University of California at Santa Cruz to receive classical art training at L'Accademia di Belle Arti in Florence, Italy -- a school originally founded by Michelangelo. 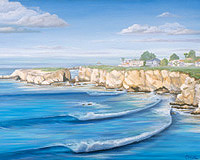 Upon her return to Northern California, Colleen discovered yet another passion, surfing, and quickly made the connection between her two loves, painting surf inspired works of art after her daily sessions in the Santa Cruz surf line-up. She received her degree in Fine Art in 1998. Shortly after graduation, Colleen began to work as a scenic artist for professional theatre in Hawaii. 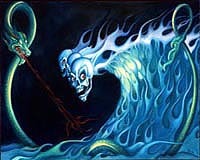 After painting backdrops commissioned by various Waikiki hotels, restaurants, and set companies. 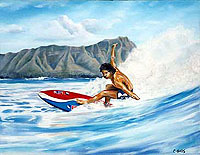 She also airbrushed surfboards for professional surfer and shaper, Larry Bertlemann. Today, Colleen works primarily in her studio with oils. 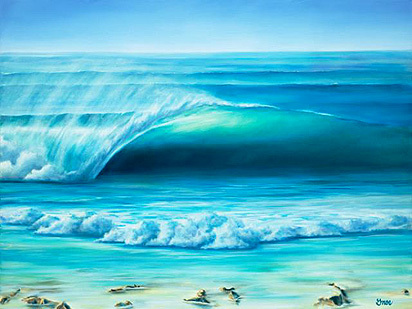 Every painting Colleen creates is in homage to the ocean and its waves. She is inspired by the translucency and beauty of the ocean waves she surfs, and paints them with the clarity of stained glass by building up the surface with layers of glazes. Colleen's technique is called 'optical mixing' which makes colour sparkle and resonate. She layers pure colour on top of pure colour which blends 'optically' or by the viewer's eye, rather than blending the colours on the palette and applying them to the canvas as most artists do, which Colleen believes deadens the colour. In each layer, pigment is suspended in a glazing medium which gives the painting so much depth, that it looks like you can actually see 'through' the painted wave. This technique is quite labour intensive and it can take 6 months to complete one painting. 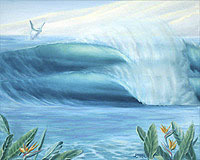 She feels it is the only way to capture the beauty of the ocean wave. 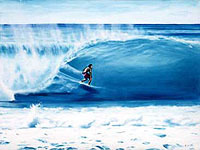 Colleen's artwork is featured in the June 2005 issue of 'Surfer Girl' magazine and can also be found in the winter 2004 issue of 'Surf Life for Women'. 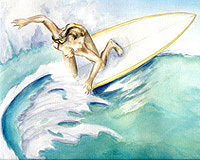 She also designed the poster for the 2002 'Women's Triple Crown of Surfing' event. Colleen can be found on the central coast of California, where she divides her time between painting in her studio, hanging out with her baby boy and husband, and of course, surfing.